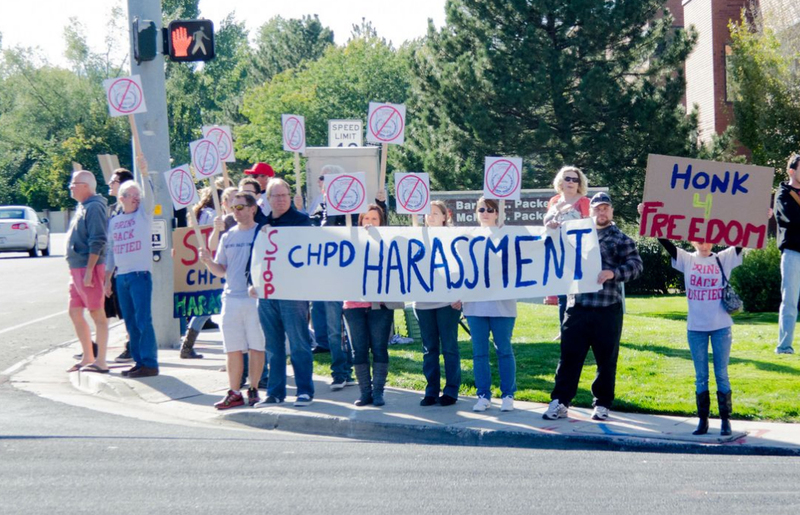 Last Saturday a group of Cottonwood Heights residents gathered to protest against Mayor Kelvyn Cullimore and the harassment they feel they are receiving from the police department that he initiated. Around 40 protesters were holding signs reading “stop CHPD Harassment” and “Culli-no-more”. Most were wearing tee-shirts that reading “Bring Back Unified”, directed to bring back the Unified Police Department. The protestors feel UPD better served their community of around 30,000 residents. CHPD has a force of 36 police officers. Their very strict DUI enforcement has lead to businesses at the mouth of the canyon including, the 7-11, Canyon Inn, Porcupine, and Lift House, realizing declines in their businesses and number of customers. They say the area now has a reputation for being, “the place where officers camp out to give out DUIs to mostly innocent motorists.” Business owners and DUI Attorney Tyler Ayers also claimed that CHPD was issuing “bogus DUIs”, giving out DUIs when drivers had only had a single drink or not blown over the legal limit.